Today, I'm finally trying watercolor technique with my Distress inks, after all these years. It wasn't easy, had to start many times over, but I finally made it! I first colored the cat with my Tombow markers and blended the colors together with water. I also added some white fur on his belly with a white pen (but the picture doesn't show it much unfortunately). For my background and the balloons, I made 2 water color backgrounds using many Distress inks. I stamped 5 times the Party girls stamp, but only the portion with the balloon. I cut it out and draw some patterns with a black pen on 3 of them. For my balloons, I used the ink pads but then, for my background I used the reinkers and thought this was much easier. My colors are much more vibrant! 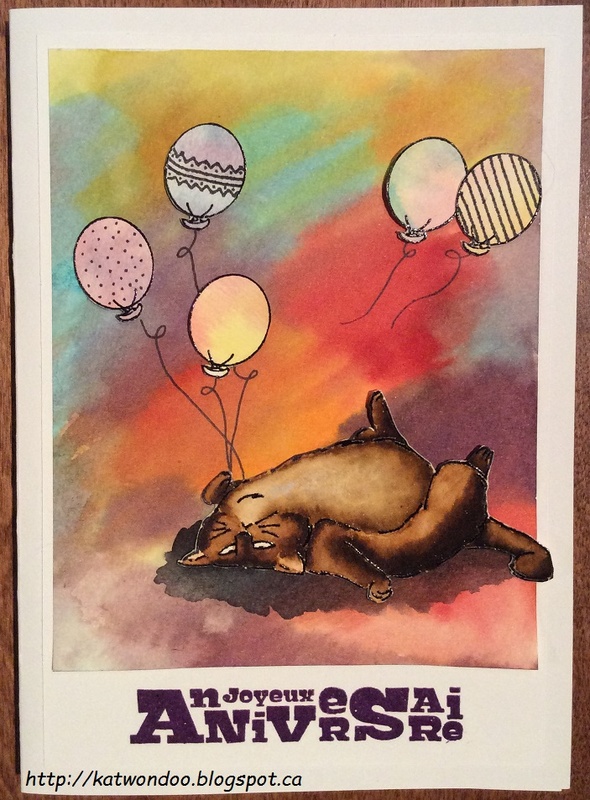 Once it was dry, I glued my balloons and the cat, and draw the twines. I stamped my sentiment (Happy Birthday) with purple ink and embossed it in clear. This is adorable! Fabulous coloring of the AI cat. Your water coloring is amazing! 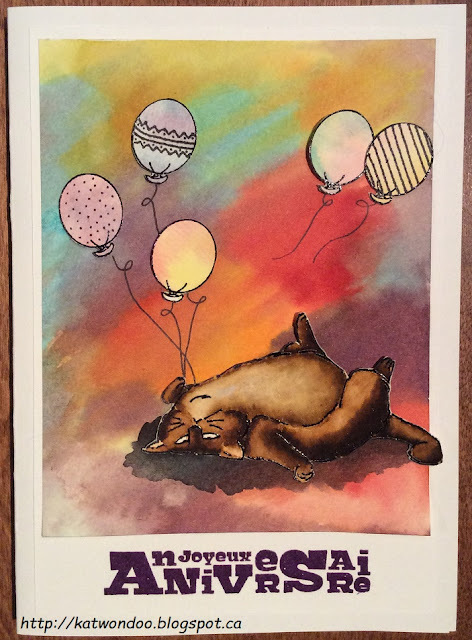 Adorable card, love the awesome background and the cat is colored beautifully. Thanks so much for joining us at the Ai watercolor challenge! Beautifully done! I love the rich and colorful water-coloring! Thanks so much for playing Simon Says Stamp Wednesday “Cute and Cuddly” Challenge! Cute card! I love the AI cat. You did a great job coloring. Wonderful card, great watercolouring. That cat is so cute, love it. Amazing watercolor background and the cat is beautifully colored. I like the added hand drawn embellishments on the balloons, too! Thank you for sharing this at Seize the Birthday! Wonderful colouring and terrific watercolour background. Thanks for playing along with Seize the Birthday. This is AMAZING!!!!! I love, love, love it!!!! Thanks so much for sharing your talents with us at Art Impressions! !